Complete with microfiber cloth, ammonia, and phosphate free screen cleaner, and a double-sided brush and pad, this screen cleaning kit provides you with all the tools to keep your devices and their screens looking new. Brand new. FREE Shipping included. 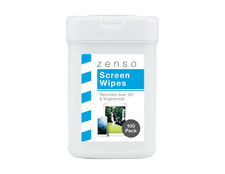 Screen Wipes. Curtain Wire. Storage case with dispenser and seal cap. Wipe gently over screen. Fixing & Fastenings. Wild Bird & Wildlife. Wall Hand Dryers. Wall Sockets & Faceplates. Set for manual cleaning of CDs/DVDs. To avoid scratching the surface with dust, do not exert excessive pressure. Spread the cleaner on the screen using the sponge and rub the screen dry with a dry place of the sponge. This makes the dirtdissolve which can then be wiped away together with the cleaner. Bildschirm Reinigungsset 3-teilig. Reiniger Tuch Pinsel. Keinesfalls verkaufen wir Ihre Daten, oder geben sie zu Werbezwecken weiter. Computerpinsel 12 cm lang. Keinesfalls verkaufen wir Ihre Daten, geben sie zu Werbezwecken weiter oder nutzen sie über das erforderliche Mindestmaß hinaus. High Performance 500 watt - 0.75HP Motor - Vac & Blow! The wipes are in one continuous stream when pulled out, but have perforations to separate each wipe and allow for easier tearing. 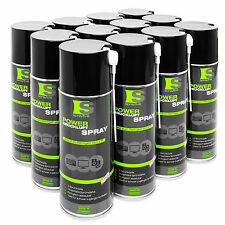 PC Screen Cleaning Wipes. 100 pre-saturated wipes per tub. Alcohol free. A high tech ultra fine cleaning cloth made from 100% microfibre. Our microfibre cloths are made with premium materials and designed to the highest quality standard. The ultra fine microfibres are highly absorbent and will remove grease with a single wipe. Mit dem hochwertigen, waschbeständigen Microfasertuch und dem speziell entwickeltem Reinigungsgel ist das Reinigen ein Kinderspiel. Konsole | Videospiele. Die gallertartige Konsistenz des Gels verhindert ein schnelles Absickern der Flüssigkeit am Bildschirm und mit dem beiliegendem Microfasertuch ist das Verteilen und Abwischen des Gels kein Problem. Vanish Oxi Action Powerspray Carpet and Upholstery Stain Remover, 500 ml. 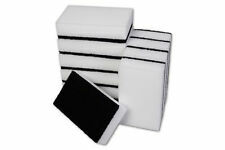 3pc Mini Cleaning and dusting brush set Ideal for removing dust, debris, flux, and other contaminants. Soft bristles. Nylon head. Precious optical grade cloth weaving the softest cleaning experience. laser cutting and lint free. Super soft microfiber - no harm to optical component. Lens cleaning cloth: 15cmx15cm 1 piece. Professional lens cleaning pen x1. ModRight Mainboard Anti-Static Mod-Mat Work and Assembly Surface (Over 23" x 23" in Size). The ModRight Mainboard Anti-Static Mod-Mat Work and Assembly Surface is the next in line of the ever popular Mod-Mat Series. Suitable for interior and exterior screens. With fresh lemon scent fragrance with rapid dry formula. project by:MS IT Services. We will always do our best to resolve any issues. Genuine & Authentic. Cleaning cloth is wrapped in cellophane and is 5" x 5". Pictures are of actual item and only what is pictured is included. · 100% ozone safe, contains no CFCs, HCFCs, propane or butane. 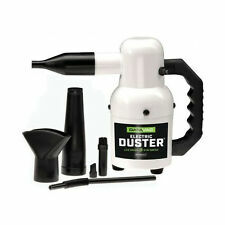 This compressed gas duster is an effective tool for removing dust and other contaminants from hard-to-reach areas. Its cleaning versatility provides a safe and effective tool in hundreds of applications. CompuCleaner Xpert. 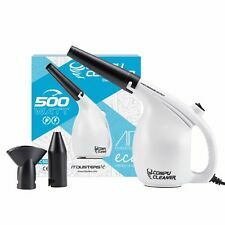 With an improved 550 watt motor, the CompuCleaner Xpert is able to blast away even the most stubborn dust and debris. Housed in the ergonomically designed plastic housing, this model is still as light weight and easy to use as the CompuCleaner original. ModRight Xtreme Super Large Anti-Static Mod-Mat Work and Assembly Surface 47x23"
The ModRight super large anti-static modmat and assembly surface is the next in line of the ever popular Mod-Mat Series. With enough room to complete your entire assembly on! The oversized modmat is a huge 1200mm x 600mm which is over 47" x 23". Staples Electronics Duster 10oz. 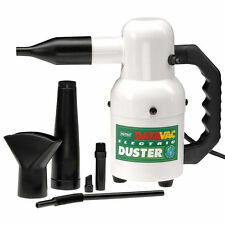 Clean out keyboards, computer fans and other electronics safely by using these 10-ounce electronics dusters. 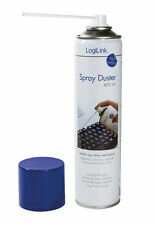 Air duster is perfect for removing dust or debris from sensitive electronic devices. You'll receive 1 x 200ml liquid bottle and 1x cleaning cloth - all in original factory sealed box as per pictures. For LCD, PC, TV, Led, PLASMA, 3D screens. SAFE FOR 3D SCREENS. Streak-free and anti-static screen cleaning fluid for effective results. With a special repair paste (25 ml) and lint-free polishing pads for easy removal of scratches on the bottom side of CDs/DVDs. 1 Keyboard Cleaning Bud. - 1 Keyboard Sponge. The P.C Cleaning Kit. - 1 Ribbed Cleaning Sponge. 1x 12" Big Screen Cleaner. Clean any TV or computer screen in seconds! Washable cleaning head is 12" wide; 9-1/2" long handle swings in for compact storage. Safe for all screen surfaces! Protective dust cover included. 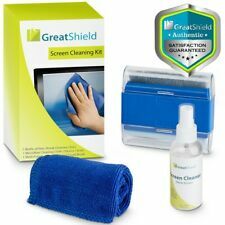 The screen cleaning kit is safe to use on all LCD screens. Complete with microfiber cloth, ammonia, and phosphate free screen cleaner, and a double-sided brush and pad, this screen cleaning kit provides you with all the tools to keep your devices and their screens looking new.